Often, it is possible to understand why a stock makes a price move. It could be that an earnings report is better than expected and the stock price jumps. Or, the company could deliver subpar earnings that falls short of expectations and the stock falls. But, sometimes a stock moves and there is no news to explain the gain or loss. Or, there is news and the stock seems to move in the wrong direction based on the news. Recently, we saw an unexpected move in a stock develop and that sets up a potential trading opportunity. Express Scripts Holding Co. announced that Avista Capital Partners, a private equity firm, will buy Express Scripts’ United BioSource division. United BioSource’s website says it helps “maximize product access and commercialization,” helps drug companies “overcome access and adherence challenges” and provides drug testing services. It also runs a free drug program that gives away Acthar to patients who can’t afford it, Express Scripts said earlier this year. Acthar, which is used to treat lupus, forms of arthritis and several other diseases. Acthar is a $35,000-a-vial medicine made by Mallinckrodt Plc (NYSE: MNK). But, some analysts have questioned the relationship. According to Bloomberg, famed short seller Jim Chanos said he was shorting shares of both Mallinckrodt and Express Scripts, claiming a “murky alliance” between the companies that has helped raise drug prices. A short seller is taking a position that will benefit from the decline of a stock. They borrow shares from their broker and sell those shares, planning to buy shares at a lower price later to repay the loan. If the stock moves down, they earn a profit but face losses if a stock rises in value while they are short. 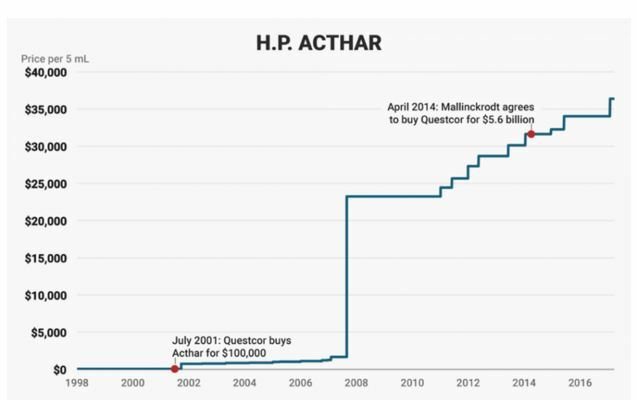 “Acthar is the epitome of excessive drug prices,” Chanos said in a slide presentation at an investor conference, noting that the list price has increased “exponentially” from $40 a vial in 2001. Most of those increases occurred before Mallinckrodt took ownership of the drug in 2014. The journey of this high priced drug is shown below. This drug is approved for treating 19 different medical problems. One of the more interesting aspects of this story is that Acthar has never undergone rigorous testing. The high priced drug was grandfathered into approval by the US Food and Drug Administration because the government didn’t require clinical trials when the drug was brought to market back in 1952. When testing has been done, independent researchers have questioned the value of the drug. However, the drug is being sold through various channels and the company has representatives dedicated to working with insurers to obtain approval for the high priced drug. The loss of a sales channel could be a factor that hurts sales of Acthar and pressures the profitability of Mallinckrodt. That means it would seem to be bad news for MNK if its relationship with Express Scripts changes. However, shares of MNK were up slightly on the news. Shares of MNK have been under pressure for some time. A number of analysts have questioned the pricing of Acthar and the ability of the company to maintain sales without strong evidence of its usefulness. That has led to the sharp downtrend in the stock even as the broad market has been in a strong bull market. That down trend in price for MNK is likely to endure until there is a significant change in the company’s news. This indicates traders who want to trade the trend in Mallinckrodt should consider trades that are benefit from moves to the down side. To benefit from weakness, an investor could buy put options. But, as the chart shows, Mallinckrodt has been in a downtrend and that has resulted in increased volatility. The higher volatility increased options premiums even more. This is normal behavior when a sell off occurs. But, high prices on put options suggests an alternative trading strategy. The option premium is high because the expected volatility of the stock is high. Options that are based on selling an option can benefit from high volatility. In this case, with a bearish outlook, a call option should be sold. 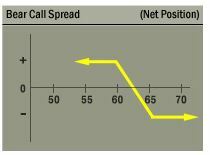 One strategy that is important to consider is the bear call spread. This trade uses two calls with the same expiration date but different exercise prices. Traders buy one call and sell another call. The exercise price of the call you sell will be below the exercise price of the long call, so this strategy will always generate a credit when it is opened. The maximum potential gain with this strategy is equal to the amount of premium received when the trade is opened. The maximum loss is equal to the difference between the exercise price of the options contracts less the premium received. For Mallinckrodt, we have a number of options available. Short term options allow us to trade frequently and potentially grow our account size quickly. Short term trades also reduce risk to some degree, since there is less time for a news event to surprise traders. In this case, we could sell a December 15 $23 call for about $0.60 and buy a December 15 $25 call for about $0.10. This trade generates a credit of $0.50, which is the difference in the amount of premium for the call that is sold and the call. The maximum risk on the trade is about $150. The risk is found by subtracting the difference in the strike prices ($200 or $2.00 time 100 since each contract covers 100 shares) and then subtracting the premium received ($50). This trade offers a return of about 33% for a holding period that is less than one month. This is a significant return on the amount of money at risk. This trade delivers the maximum gain if Mallinckrodt is below $23 when the options expire, a likely event given the stock’s trend. Call spreads can be used to generate high returns on small amounts of capital several times a year, offering larger percentage gains for small investors willing to accept the risks of this strategy. Those risks, in dollar terms, are relatively small, about $150 for this trade in Mallinckrodt.